Camelot’s attempt to become the 16th winner of the Triple Crown and the first for 42 years ended in disappointment as he went down by three-quarters of a length to Godolphin’s Encke. Encke, a 25/1 chance, benefited from a superb Mickael Barzalona ride as he was kicked into the lead two furlongs from home. Try as he might, Camelot was never quite getting to Encke who responded most gamely to the urgings of his Corsican rider. Simon Crisford, Racing Manager for Godolphin, commented: “We are probably not going to be the most popular winner on Town Moor today but from our point of view it was a fantastic result, giving Godolphin its sixth St Leger success. “Mickael Barzalona has given the horse a superb ride and put the race to bed when he kicked on at the two-furlong pole. There was a question about Encke’s stamina, but in the end he has stayed it well. “Encke has a fantastic pedigree and is a horse that has always been forward. “We put a line through his last run in the Great Voltigeur Stakes which was a false run race. “From the furlong pole to the finish, I thought Camelot was never getting to us. “My first thought is that it was a steadily-run race and I knew straightaway, after going a couple of furlongs, that was the case. I should have run a pacemaker or two but I thought that the pace was going to be strong. “The minute the gates opened, Josesph was where he was and he couldn’t do anything about it. That’s exactly where I would have wanted him to be - when he is a horse going this distance. Joseph had to relax him and he did, but Camelot just tanked a little bit early because the pace was steady. “Joseph had to take his time down the straight and wait for the gaps to come, which you would do with Camelot anyway. When the gaps came, the winner was in probably a handier position and was gone - when Camelot got out, he just stayed on rather than quickened up. He quickened up in the Guineas and the Derby but that was always liable to happen because we were running him a bit further than his distance. “My regret is that I should have run a pacemaker or two and it would have made it a little bit more straightforward because that means he would have settled a little bit earlier, a little bit better and he might have quickened a bit more than he did. "That’s the way it is and well done to the winner. That’s the reality of it, really. Godolphin trainer Mahmood Al Zarooni enjoyed his second Classic victory at Doncaster today when Encke caused a 25/1 shock in the Ladbrokes St Leger, beating the red-hot 2/5 favourite Camelot by three-quarters of a length. 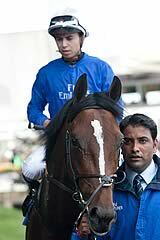 Al Zarooni’s previous Classic success came with Blue Bunting in the 2011 QIPCO 1000 Guineas at Newmarket. The Newmarket handler commented: “We have been trying to win this Classic. Two years ago we ran Rewilding and last year we ran Blue Bunting who were both favourites. Today we have won it with an outsider. Racing can be a funny game. “It was a brilliant ride from Mickael which I think is a sixth St Leger win for Godolphin and His Highness (Sheikh Mohammed). “To be honest, it was His Highness’ decision to run here today. I disagreed and thought we should not. He was right. His Highness and I always disagree but His Highness is always right. 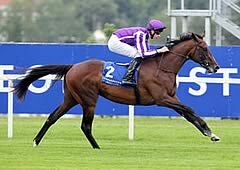 “I thought Camelot would catch us as I remembered the way he quickened in the Guineas and in the Derby. I saw the other horses were tired and I knew Encke was tough and would keep going.